This grand, historic, Victorian/Queen Anne home was desperately in need of new windows. The previous windows were 20 years old and hard to open. Several of the windows were starting to fail which caused outside dust to seep into the house. Fortunately, the homeowner was an interior designer with a keen eye for aesthetics. With a desire to keep the historic feeling of the home intact, she shopped around for quality replacement windows at the right price to suit her project. Our Milgard® Tuscany® Series windows fit the architectural style and provided a traditional look she was hoping for. The crisp, white frames complimented the homes appearance and the even sight lines provided visual balance from window to window, with the top and bottom rails being of equal height. The homeowner also noticed the noise-reduction she experienced once the new windows were installed, resulting in increased comfort and enjoyment. With a lake view in the backyard, the homeowner wanted to make the most of her balcony view by installing French rail sliding glass doors to allow extra daylight into the home. French doors are a classic look and the sliding operating style worked well in this home because there was little room for a patio door to swing inward or outward. It also provided the opportunity for additional ventilation upstairs. 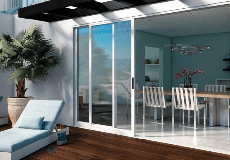 Tuscany Series come with smooth operating SmartTouch® hardware for both the windows and patio doors. The homeowner told Milgard that she uses the windows a lot more than she ever did before because now she can open her windows with ease.